6.65 points at 17 votes (rank 453). "Hmmmm...whats on today? The Glog - Chaos in Moskow? Sounds good, we will take a look at "that one" ...two tickets for the pit please...yes, we are both already 16!!!" 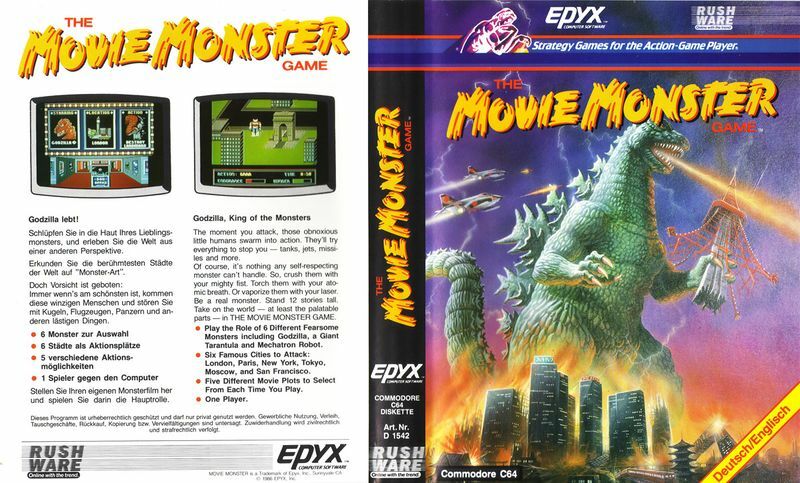 "Excuse me, but I think these are our seats..."
The Movie Monster Game is an arcade game by Epyx from 1986. 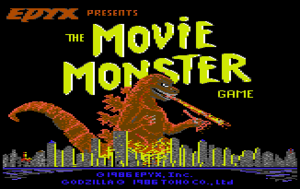 The player can haunt a town of his choice with a movie monster and fulfill a previously chosen mission there, e.g. destroy a sight, rescue your abducted young or simply destroy everything. Police, tanks, jets and other opponents give him a hard time. Tear down houses with your mere fists! Swallow tanks in one piece! Give Big Ben one on its bells or bend the Eiffel Tower: dreams as old as manhood itself. 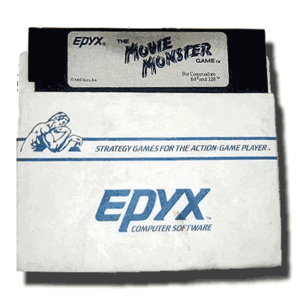 Already in 1983 did Epyx attend to this basic need of human existence and produced a game with the promising title "Crush, Crumble & Chomp", which was about destroying as much as possible as a movie monster. 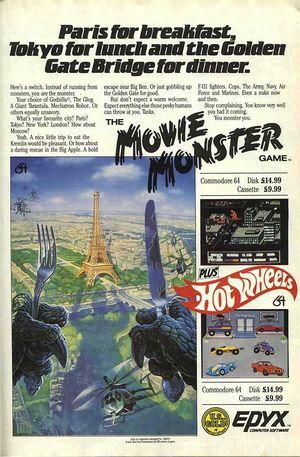 In 1986 the game -at that time written in Basic - was found to be not en vogue enough any more and decided to release an improved version: The Movie Monster Game. They even invested in a licence to be allowed to use the name of the Japanese national hero Godzilla. The game starts with the options screen presenting itself as the outer view of a cinema. Here the player can set with the joystick, which monster he wants to play and what should be the plot and where this all should happen. The next station is the movie theatre. The curtain swells, the light is darkened and what follows is of course at first advertisements for sweets and brazen covered advertising for other Epyx games as e.g. Super Cycle or Winter Games. Then you will be put in the mood for the following happening and the actual game starts. The player now steers the monster and has to try to solve the task that he has chosen. Points are awarded for destroying skyscrapers and other objects as jeeps, helicopters and cars and also for each human that you smash or eat. An energy display shows when it makes sense to leave the town because dying is not rewarded. Independent from which monster has been chosen, you have at your disposal, next to the abilites that every monster has, also monster-specific possibilites to attack. So Tarantus the huge spider e.g. can shoot a net or Sphectra the huge wasp can change between ground and flying mode. If the player makes it to fulfill his task, he gets a bonus on points and can decide, whether he wants to strain his luck to make even more points or he decides that the movie is over now and he wants to leave the city. The game then returns to the movie theatre and correspondingly to the ending the end of the movie is clad in words. After that the end titles are shown, the light is switched on again and you are in front of the cinema again. "Oh now, look: Mr. Meringue destroys the Epyx headquarters in San Francisco! Is "this" how you thank your creator? *shriek! *"
The options screen and the epilogue in the cinema are designed pleasingly and imaginatively. Although slightly falsified in the name, the monsters are well recognizable and of course, also on which "real" cinema monsters they are based. The animation is done competently and fluently. Also the sights of each town as e.g. the Kremlin in Moskow or the Golden Gate Bridge in San Francisco are realized convincingly. The rest of the rural area is given in a stark contrast: greyish prefabricated slab-construction atmosphere everywhere you look, the cars and humans were desgined utterly reduced and almost lovelessly. Especially disappointing is the animation of collapsing skyscrapers, they sink into the ground rather unspectacularly similar to a folding accordion. 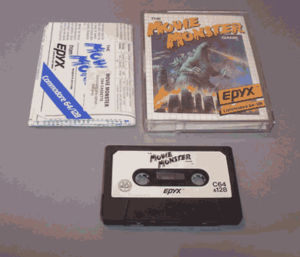 Concerning the sound, Epxy games were never an epiphany and there is no special exception in Movie Monsters. The only longer piece of music is played in the title / options screen and has a certain laxness and haunting character despite the tinny and thin instrumentation. Furthermore, there is an own recognizing tune for each town at the start of the game, as well as short jingles when a monster has completed its mission. These are nice details. During the game you get to hear several different effects of which some are very successful as e.g. the motor sound of the helicopters and the panic hooting of the cars. Other effects on the other hand sound absolutely replaceable. Lured by the moanful call of its offspring, Tarantus comes running to rescue it from captivity. Isn't that sweet? In contrast to reality the cinema commercials can be graciously shortened by a press on the fire button. The mighty Mechatron succumbs to a hostile superiority in an honourable fight. Each monster posesses two basic abilites: "Scream" and "Atomize (up)", as well as individual special abilities (see below). Scream: With this striking primal scream (which sounds different for every monster) humans and vehicles can get paralysed for some time with a certain chance. The effectivity of the scream varies from monster to monster. Atomize (up): With this attacking jets or helicopters can be destroyed. Does not always work. These abilites are not available limitlessly, same as the most special abilities. If you use them too often you have to wait some time until they are "reloaded". Furthermore each monster have a certain strength, speed, endurance and the ability of self-healing. The superstar among the monsters, an almost 150 meter high dinosaur that has fought in its numerous films sometimes with and sometimes against humanity. In the game Godzilla stands out with his strength, which enables him to destroy houses relatively fast. His slowness on the other hand is almost equally unique. Aha, this oversized monster also somehow has a familiar ring. With his eight legs the Tarantus is faster than a speeding bullet, which can make him escpae fast from difficult situations. As his strength is only average, he is not the first choice for excessive rioting. Slow, but equipped with excellent regeneration. No other monster can get back lost life energy as fast as the Glog. But it is till too little to be able to fully ignore tanks and jeeps, and here his slowness is its undoing. The weakest and at the same time fastest monster of all. Sphectra is best moved constantly flying to be able to play his greatest advantage. If he does not make it, it needs only few hits to destroy him. Hard to oversee, who this should be! Fans of Ghostbusters have of course instantly uncovered the "ever-popular Marshmallow-Man". A rather average guy that gets severe problems in almost all missionss due to his lacking speed and then ends as roasted foamy sugar. Special ability: can spit foamy sugar, loses control over his movements in water and then floats away. Mechatron is together with Godzilla the strongest monster in the game, however, with a fateful difference: he has no self-healing and must in no case touch the water. In return he is a much better walker than his prehistoric colleague. Special ability: laser beam, loses life energy when standing in the water! * You start the game in the middle of the town, after breaking out of your prison in which you were supposed to be displayed as an oddity to the agape world. Huge amounts of tanks, jeeps and other dangerous enemies linger in the direct vicinity. Take to your heels and try to leave the town as fast as possible, before the military makes mincemeat of you. TIP: In this mission fast monsters and those that have no problem to take short-cuts over water areas have clearly an advantage. * Your last fully-fledged meal was already weeks ago and McMonster is unfortunately closed. So you stuff yourself with everything that gets between your claws, jaws, mandible or pseudopodia. A hunger display at the lower part of the screen shows you when you have eaten enough and it is time to retreat for a digestive nap. TIP: Each monster has a weakness for a certain food. So the one e.g. likes eating policemen filled with doughnuts while the other rather likes to chew on sinewy, armoured vehicles. * Since this damned radio station constantly broadcasts this horrible pop music, you cannot get any sleep. Find the source of the evil with the help of the proximity display in the lower part of the screen which increases, the closer you are to the transmitter, which maybe is also placed on a sight of the town. Having arrived there, make the thing crash and just to be sure, trample on it extensively. Problem solved. * These busy humans have stolen your offspring and you will turn the whole town upside down to find it. Again the proximity display in the lower part of the screen helps you here. Only that this time there is no constant display, but it is shown in random intervals how close or far you are from your target, this is at that point when the call of the abducted sounds. TIP: By using the own "Scream" ability you can sometimes provoke the answer call of the young. * There are no rules here... it is simply not your day and you are hopping mad and you want to let off steam monster-like. Just smash everything that comes your way. Have a good time! TIP: As the safest way to make points is destroying buildings, strong monsters are especially advantaged in this mission. And what monster, that is a proper monster, wants to be mocked by some movie idiots because you have reached less than 1.000 points during berserking? Sphectra's attempt to land on a double skyscraper ends tragically. If it is not enough for someone to play a meters high, mega strong monster, he can be recommend the version by "Nostalgia", in which you can play a meters high, mega strong and INVULNERABLE monster. Furthermore the special attacks can be set to "unlimited". With this, new options arise, as e.g. to try as Marshmallow-Man to destroy the Empire-State Building by using spit attacks and other sophisticated possibilities. 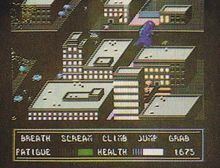 Monstertron2084: "Monsters, missions, metropolises! Though excellenty presented with much love for detail, optically in parts really grand and also sound technically mostly up the mark, The Movie Monster game cannot fully convince. At first one has to name the lack of speed in the game - you occasionally chug unbearably slowly around and with some monsters you even have problems to overtake pedestrians. This can just not be correct. Additionally, the feeling arises fast that you have seen already everything, and really everything, despite the altogether 180 possible variations (which, however, are very silimar). This is really regrettable, because the idea of the game is great and also everything around. Only concerning the playability and tension there is very much left to desire. It hurts my soul to give this really nicely presented game only 7 out of 10 points, but there is not more in it, and the points are only if you play the game only once in a few months." Bamse: "I have played the game only a few days ago: Unfortunately the game idea is more charming than the game itself. Nice presentation, "real" cinema atmosphere, funny introduction texts and cheeky allusions to classic movie monsters... But when I finally wanted to destroy Paris as Glog, I crept slowly through empty squares, only saw a few brick skyscrapers except for the Eiffel Tower (ah: Paris!) and could only wait with a real (and sloooow) attack that my monster will finally be overwhelmed by the only little active army. What a pity :("
Rykzilla: "First loaded, I was amazed by the menu and the intro. In contrast, the actual game is a little disappointing. Lagging controls, slooow monsters, enemies who are not even in the screen but fire from somewhere. Though the monsters are animated quite beautifully, the background graphics are rather boring apart from the sights. There is a nice title music, wheras you only find FX and jingles ingame. In spite of all those flaws, I still think it is a good game, once you got a feeling for all the characters and start accomplishing all the missions with them. Including fanboy bonus I rate this 6 points." Blob-arju: "One can rummage out Movie Monster Game every now and then for half an hour. The optical presentation and also the funny, even though on long term surely a bit monotonous, gameplay allow this. But it is not enough for more. After all still 7 monster-like points from me." 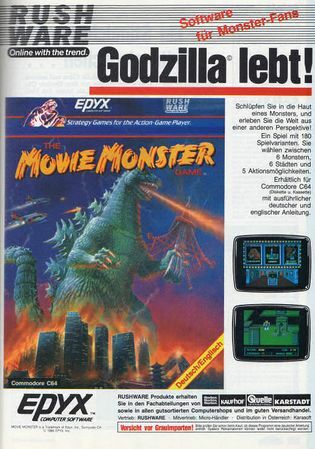 Godzilla - Is of course Godzilla and forms the only exception: Epyx has secured the rights to using the name. Therefore also the "(c)" behind the name. Tarantus - Tarantula, the huge spider from the movie with the same name . Sphectra - Mothra, the cloth moth from various Godzilla movies. Longplay: All monsters in action once, all missions played through once. This page was last modified on 13 September 2015, at 17:50.